Following user reports of BD-Live connectivity problems with this week's Blu-ray release of 'Iron Man,' Paramount has released a statement regarding the status of the disc's functionality issues. 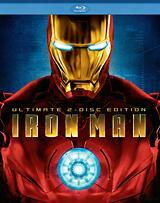 "The Iron Man Blu-ray went on sale Tuesday and due to the overwhelming popularity of the release an unprecedented demand was placed on the BD-Live connection. The disc represents a truly state-of-the art Blu-ray presentation with a first of its kind BD-Live application. As such, the heavy amount of traffic strained the servers due to so many people heading to the same destination. The bandwidth capacity was increased in preparation for the release but the demand exceeded all expectations so capacity was expanded dramatically last night and local servers were established worldwide to accommodate all the fans. The issue should be completely resolved but if anyone experiences a brief traffic jam, we have provided consumers with a menu option during disc startup that allows them to go directly to the movie main menu or continue to download the BD-Live features." We'll keep you posted on any further developments in this story as they come to us.